This article on engagement ring statistics was last updated on December 18, 2018. This article will hopefully help couple’s make more informed decisions when purchasing their engagement ring. Here are some of the statistics that we compiled based on our research. See below for sources and techniques of how we gathered our data. From the 10,000’s of couples who we surveyed in 2018, 24.4% of them said that they have allocated a High Budget towards their engagement ring. 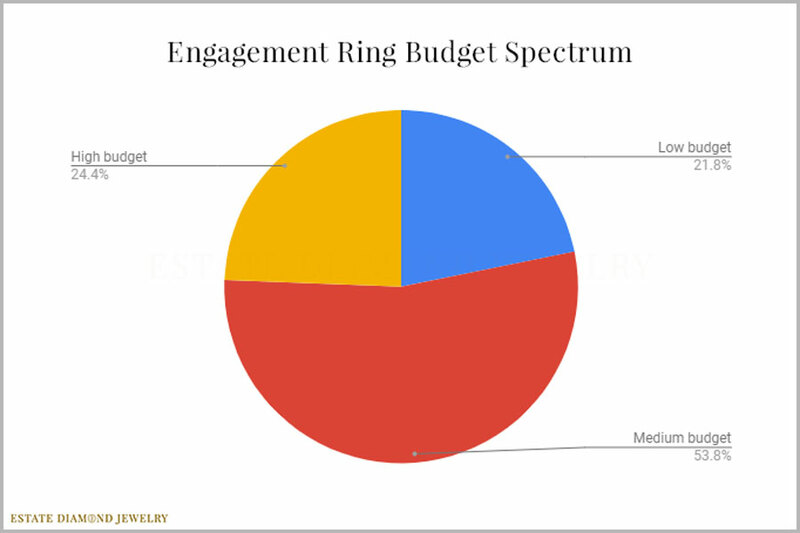 54.8% of those surveyed said that they have allocated a Medium Budget towards their engagement ring. Only 21.8% of the people asked said that they allocated a low budget towards their engagement ring. Of course, this data only represents a relative figure that can only be understood based on each couple’s personal budget. This statistic, however, belays the importance that couples in 2018 are placing on their engagement rings. Part of our questionnaire asks the couple’s to gauge their lifestyle. The options were between modest, average, upper class, and luxury. 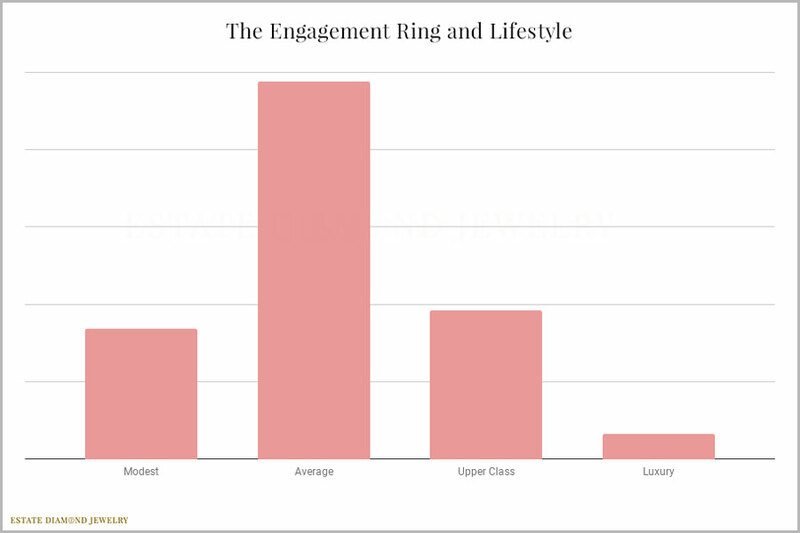 This graph represents their answers and also give insight into the self-projection of where people think that they are holding when in the search for an engagement ring. The overwhelming majority of couples felt that their lifestyle was average. Like some of the earlier graphs, this statistical chart gives relative data instead of numerical data. The amount of debt isn’t a set amount but rather a relative amount as defined by the survey-takers expectations and opinion. Only 28.4% of the couple’s surveyed had no debt. 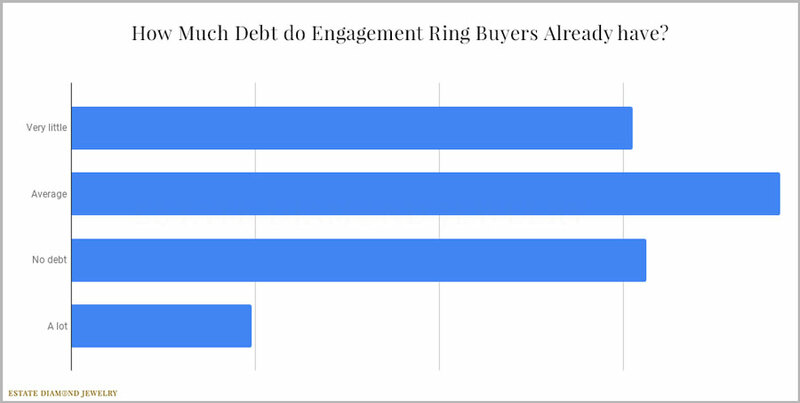 The remaining 71.6% of people looking for engagement ring already had existing debt. This data chart is interesting. It shows the popularity of the keyword “engagement ring” over the years. It starts from 2004 and runs until 2018. The popularity of the keyword has stayed more-or-less in the same place. There was a rise between 2009 – 2012. The keyword has slowly been decreasing since 2012. Important Note: It could be that the searches have gotten smarter and more people are typing more complicated searches into google instead of the simple catch-all “engagement ring”. Couples are probably typing something like “3-carat vintage engagement rings” into Google instead. Estate Diamond Jewelry has been in business since 1981 and has a large network of buyers. Because we focus on ethical jewelry and vintage engagement rings, our niche is limited and our personal data doesn’t reflect the market as a whole. It is for that reason that we discarded our own data and began collecting data from a fresh angle. 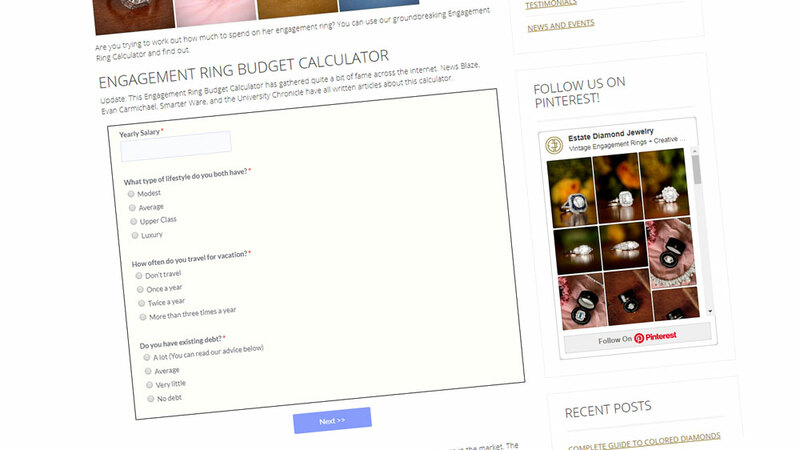 In 2016, we created an online engagement ring budget calculator that has so far quizzed 10,000’s of potential engagement ring buyers. The form helps couples discover an appropriate budget when shopping for their engagement ring. 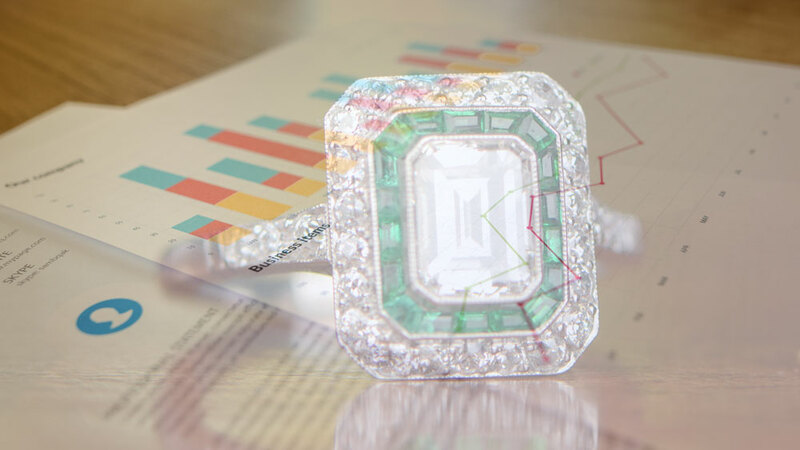 After discounting the outlying and erroneous data, we have managed to discover fantastic data that sheds a lot of light on the engagement ring. In 2017, we created another form called the engagement ring finder. This form helps couples find their dream ring. They input what type of ring they are looking for and we search for them. We always encourage our potential customers to buy vintage, but the results aren’t limited to the niche. Some of our data is also collected from other jewelry stores and websites. We used Google Trends to determine our search-based statistics.